Dixa and I were neighbors in Panama. I remember the first time she came to my house. She knocked on my door and said "Que haces?" I pulled out my Spanish-English dictionary and asked confused, "What am I making?" We couldn't resolve the translation problem, both shrugged and Dixa left. Then she came back with her husband who helped us by serving as translator. 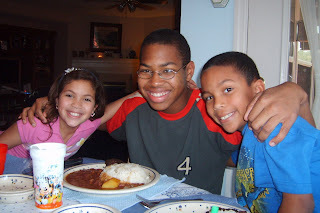 Over the next three years, my Spanish improved and Dixa learned English. Dixa showed me the beautiful world of Panama. She served as tour guide for Anna and I for culture, shopping, and day-to-day life. In fact, one of my favorite things was dropping by her apartment just before our husbands got home for the day and tasting whatever she was making. One day, when I went over, the smell was heavenly. She lifted the lid on the pot and I saw a whole fish...head, tail and eyes looking at me, and I shook my head that I didn't want to try it. She asked, "Americans don't eat fish?" I am very grateful that the conference didn't have exhibits on Sunday. 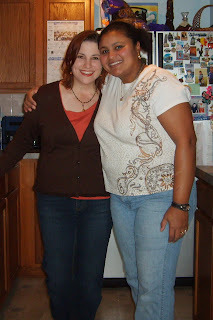 I got to spend the day with Dixa who now lives with her husband in Jacksonville. After dropping Erin-the-Wonder-Woman off at the airport, I had an eight hour window before I had to pick up Nancy-the-Insightful. 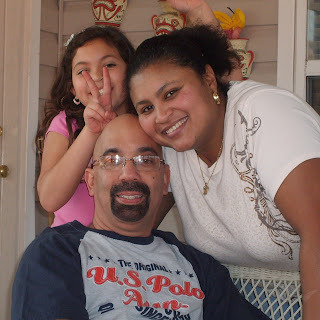 Dixa has a beautiful home and an even more beautiful family. Her son, Eric, is 15 and is an artist and on the swim team. Duneska is an amazing dancer, plays clarinet, and is full of sparkle and energy. Gabriel Jose--called GJ--is about all things sports with soccer being his favorite. Dixa made an amazing breakfast, and later lunch of wonderful Panamanian foods. And though I normally follow a vegetarian diet, I didn't today. Empanadas (AMAZING), ojedas, oatmeal with canela, bisteak, plantains...and my favorite. Dixa's incredible flan. We hung out and talked. Played Wii. Jumped on the trampoline. And Duneshka taught me to play mancala--which turned out to be really fun. It was a beautiful day, so we sat out on their porch--which Joe finished with beautiful tile and Dixa furnished with lovely things. One of the things that I was struck by is how tight their family dynamic is. We all played games together. We talked together. The kids helped and interacted. As we sat there talking I realized the beauty of their home wasn't about the beautiful furnishings but about the warmth and love of their family. Five pm rolled around way too quickly, and I rushed out to pick up Nancy. After a quick stop on the way back to the hotel at Target to grab manicure supplies and a Mancala game of my very own. Nancy and I are enjoying a bit of pampering, the super bowl and the two pieces of flan Dixa packed. 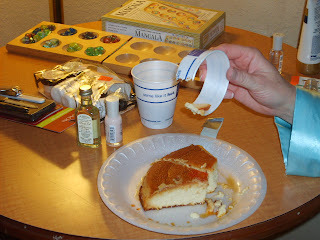 Of course, we had to MacGyver a fork out of a cup...but the flan is definitely worth it. I am glad you had such a wonderful day, I enjoyed the Super Bowl very much at home.